If you thought counterfeiters just targeted high value and key date collector coins then you’re wrong. 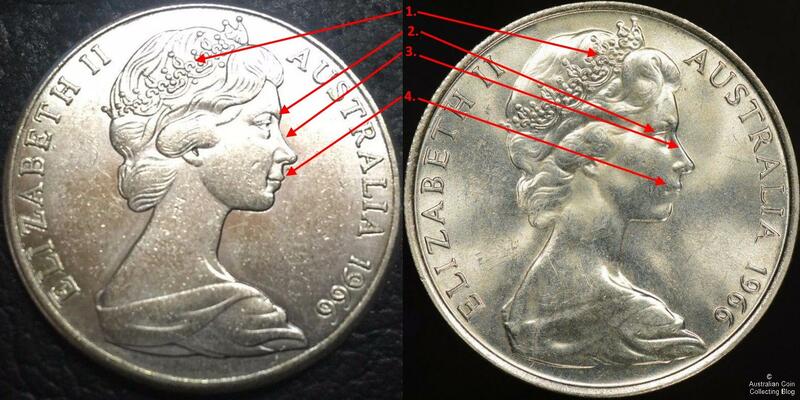 We’ve found fake Australian round 50c coins being sold on eBay for a similar cost to genuine coins at about $8 each. The fake coins are made from (perhaps) copper and have been imported from Chinese counterfeiters to replicate the 80% silver genuine coins usually purchased by coin and bullion collectors for their silver value. The design appears to be a reasonably good copy but when you look at coins as much as we do then you just have to shake your head about how bad the design actually is. We’ll point out some of the features in closer detail. 3. The outer edge of the shield is plain and missing important design elements on the fake coin. 4. Bulbous cheek giving the lips and mouth a cheeky look on the fake coin. Here the portrait just looks wrong! The design is just not as refined as it should be. The whole fake coin design, portrait, emu and kangaroo has the rounded and bulbous shape that we’ve seen in these fake 2000 $1/10c mule coins. These fake coins are not stamped “COPY” as replica coins should be, they have been manufactured to deceive. Please be aware that these and many other fake coins are out there and sellers are ready to take your money deceptively. Take care, inspect your coins closely, get expert advice if you’re not sure, buy from a reputable seller or coin dealer with a return policy or purchase a coin in a PCGS or NGC slab (not a backyard slab).